Growing up in a desi household, I don’t recall my first encounter with chiya. What I do remember is juxtaposition of sounds, smells, and sights that make up my personal definition of tea-drinking. The crisp aroma of tea leaves boiling to the perfect tint. Newspapers ruffling with my mother’s morning tea as I closed my eyes and nose to gulp down milk.. intolerable even at its most child-friendly-chocolate form. Sometimes I asked to have tea for breakfast. I was told that I was too young for tea, and educated on how calcium in the milk is very important for growing children like me because it makes the bones strong. When I pointed out that Ani, one of the house helpers who was younger than I was drank tea everyday at breakfast and at supper with no milk, I was enlightened about how privileged I was to be able to afford milk. “Arre. This child.” I was offered my two remaining sips from the tea-pot. A common sound I grew up associating tea with was sschshshshhhh. A regular visitor at our home poured his tea on the saucer and sipped aloud. “What a gawaar. He drinks tea like he just rolled out of the village. ” I’d roll my eyes. After a couple of years I toured around some of biggest metropolises in Japan, and found everyone sipping ocha and slurping noodle with a familiar sound from my childhood sschshshshhhh. So, ssschchhhh-ing while drinking tea I unlearned is actually complements flavor and taste-comparable to taking champagne in a flute, brandy in a snifter or burping to show appreciation of good middle eastern food. Now I am dating a foodie who often sips, slurps and eats aloud to savor the taste of great dining and drinking. 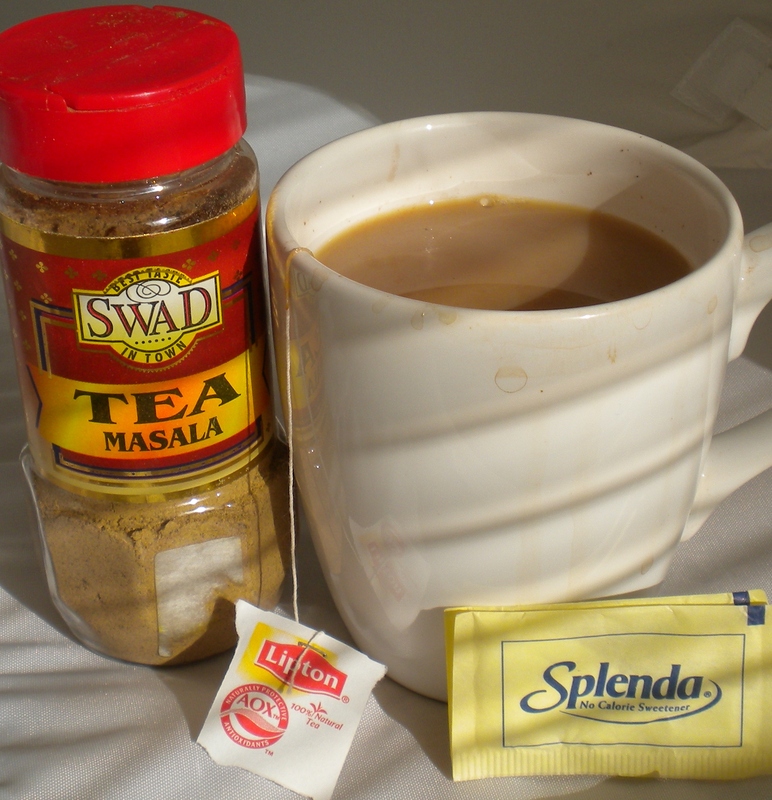 After moving to the United States, some of the most religious tea-drinkers I met vividly remember stumbling upon Ceylon tea or Himalayan tantra-mantra chai-latte at Starbucks. Some remember the adrenalin rush of waking up at 5 A.M for garam-garam chai cuttings (parallel to espresso shots) in their college study abroad trip to India. While some discovered through a desi roommate, colleague or a chance potluck gathering. One cutting before work at nearby chaiwalla’s thela at Nehru Park. A cup of teh tarik at an upscale Asian fusion hub at Central Park. If you like to make your own, chances are your kitchen pantry, the top of your microwave at your home or work space is equipped to make tea. You may add two tablespoons of tea leaves, a pod of cardamom, fresh grated ginger and 0.15 grams of pepper with 2% milk 56.79 seconds before boiling point. Or a Red Label tea bag, cream and a sachet of Splenda. Or just Hot water and Gurinar’s chai mix. You may follow a strict recipe, or you may have an open relationship with tea-making, or you may not drink tea at all. Whatever the regiment, relation or relevance, like any other food or activity of cultural value, for most desis drinking chai, cha, chiya, teh, and/ or tea has personal, emotional and psychological significance.